Im pleased for gaining weight since I was too skinny before (in my opinion) Now I look like a normal person, still slim but with a muffin top I really dislike. Seems its not going away anytime soon despite my sweating at the gym. Having a baby and approaching the big four nill in two years time seem to have hit me hard. I knew my body would change after having a baby but Im not in favour of all the changes. I guess I just have to embrace my new body, after all it supported me through pregnancy, birth and nursing and for that Im forever grateful. Anyway I really enjoyed my first day back at work, I felt a sting in my stomach when I left home that morning, missing my little one and wondering how she would get on with her dad for a whole day. But no need to worry, they did great at home and I was so busy at work I didnt get the chance to miss my baby (uhm hardly at baby anymore at 10 months of age) at all. I love to mix red and pink, its such a fun colour combination! Welcome back, Monica! I think you look gorgeous and just right - curvy but still with those beautiful long legs. Don't worry about a few little pounds ... you have a wonderful tall and curvy figure, and you look great. 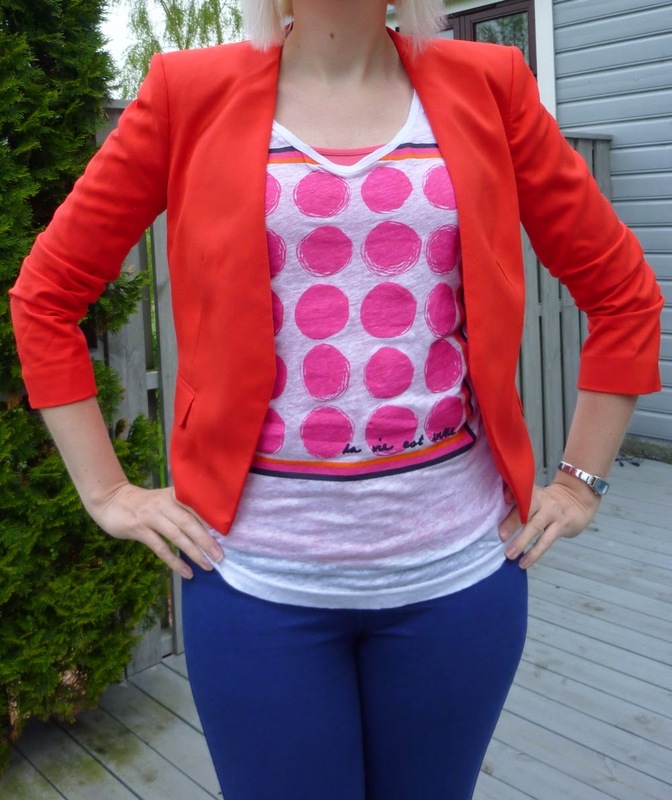 Very cute cropped jacket, and I like the way the layers work for you! Your colors are perfection and lots of fun.